El desarrollo comenzó en 1944. 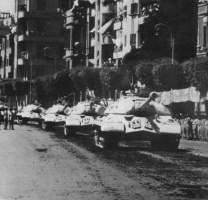 Los tanques IS-3 no se desplegaron durante la II Guerra Mundial. Sin embargo, 52 vehículos tomaron parte en el Desfile de la Victoria en Berlín el 7 de septiembre de 1945. 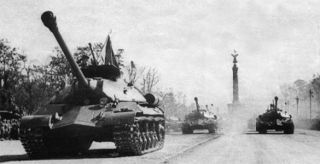 El IS-3 se produjo en serie en la planta Kirov de Chelyabinsk a finales de 1946. Se fabricaron un total de 2305. Center turret roof panel is only 20mm, meaning almost all guns faced will overmatch it if they can see it. Its playing style is well-suited to aggressive force leading and peek-a-booing. 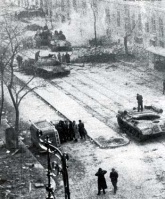 The IS-3 will find itself at home on urban maps and other maps that allow it to take cover and move to get close to its target. A semi-hull-down position works well in the midrange, covering the vulnerable lower glacis and forcing shots to be taken on the effective frontal armor or extremely hard-to-penetrate turret. Thanks to its spaced side armor, it often takes non-damaging shots on the sides, but the tracks tend to get damaged often. Once the 122 mm BL-9 is unlocked, the IS-3 displays truly fearsome power and is among the kings of tier 8 tanks, able to threaten even tier 10's. The V-2-54IS engine, the 12RT radio, and the 122 mm D-25T gun carry over from the IS and can be installed immediately, putting the IS-3 in a great starting position.